How can we support Los Angeles’ music scene(s) and work together to continue to create something robust, diverse, and dynamic in this changing era? This day-long conference expands the conversation of how Los Angeles can grow and connect/collaborate around its diverse music scenes. If other cities are challenged by gentrification in having vibrant live music scenes, (a) why is Los Angeles seeming to be growing, despite these difficulties and (b) how we we enhance and amplify this growth? This Conference is the second in a series of events that UCLA Center for Music Innovation is holding with this Future of Music in LA focus across 2019 across LA, so we welcome you to be involved in those programs as well. On February 6th, the City of Los Angeles Department of Cultural Affairs held a half-day Symposium as part of its February COMPOSE LA series of events. With partners that included UCLA’s Center for Music Innovation, they brought together different voices across Los Angeles and music to talk about the future of Music in Los Angeles. Los Angeles is a complex environment. From panels and provocations, we came up with many things that weren’t right within the overall ecosystems in terms of policy, permitting, and procedures. We also explored our very vibrant environment that seems to be growing — despite the systemic challenges. We invite the community gather again on May 15th at UCLA to both expand the conversation and to add new voices into the mix. We’re going to include people joining us from video conference from other cities and locations. We’re going to include new parties — and parties with different perspectives. And we’re going to include roundtable conversations, where the conversation will come out into and with the audience. We invite you to join us for this community event at the Charles Young Research Library at the UCLA campus. The event will be free, along with the support from our community and marketing sponsors. Sessions and the full schedule will be posted mid-April. There’s been a lot of talk about applications of blockchain technology and cryptocurrency payments in the music industry. In fact, there isn’t a single major music industry conference that doesn’t dedicate some programming to related topics. There are several projects and startups currently underway to address licensing, discovery, attribution, remuneration and more with blockchain, smart contracts, and cryptocurrency. For those of us who aren’t blockchain developers, simply keeping up with the many applications of blockchain in the music industry is the closest we’ll get actually knowing how this all (could) works. I’ve been thinking about how blockchain and cryptocurrency could speed up the process of paying U.S. songwriters, who wait upwards of 1.5 years to get paid for the use of their songs on Spotify outside the U.S. The current state of the flow of international publishing income to U.S. Independent Songwriters who own their publishing and use traditional publishing administrators to collect in the U.S. is quite depressing. As an example, Tommy released a song on Spotify in January 2018. In the United Kingdom, the song earned $100 “publisher share” Spotify UK digital public performance royalties. START: $100 “publisher share” of Spotify UK digital performance royalties in January 2018. 1. PRS collects Tommy’s publishing income in the UK ($100) in January 2018. 2. PRS retains 10% admin fee and remits the balance ($90) to ASCAP in October 2018. 3. ASCAP retains 12% admin fee and remits the balance ($79.20) to the Publishing Administrator in February 2019. 4. Publishing Administrator retains 20% admin fee and pays Tommy ($63.36) in July 2019. END: Tommy is paid $63.36 for his Spotify UK “publisher share” income (earned $100) after waiting 1.5 years and experiencing a reduction of 37% of his royalties. Imagine $1,000 reduced to $633.60 or $10,000 reduced to $6,336.00. Had Spotify used blockchain technology to dynamically identify Tommy as the rightsholder in his song and paid him instantly at the close of the month with cryptocurrency, Tommy would have already spent his $100 on studio time! Today, the Music Modernization Act has passed the U.S. House of Representatives with a unanimous 415 – 0 vote (16 reps abstained from voting at all). The mega bill — which consists of a bundle of Titles that were previously independently proposed bills — will change the way in which musical works are licensed by digital service providers and provide a safe harbor for infringement under a blanket licensing mechanism (Title One – Musical Works Modernization Act); it will bring recordings made before 1972 under federal copyright protection (Title Two – Compensating Legacy Artists for their Songs, Service, and Important Contributions to Society Act or CLASSICS Act); and it will codify an allocation of digital radio royalties to music producers and sound engineers (Title Three – Allocation for Music Producers Act or AMP Act). On its surface the MMA sounds amazing, when summarized this way. Accordingly, the passing of the MMA in the House was widely praised by executives from the most recognizable U.S. music rights organizations and trade associations (e.g. NMPA, RIAA, DiMA). However, there remains many uncertainties in the language of the bill presenting an opportunity for the Senate to course correct before the bill becomes a law that would take over 20 years to improve, again (the Digital Millennium Copyright Act was the last piece of legislation impacting the music business — it was enacted in 1998). 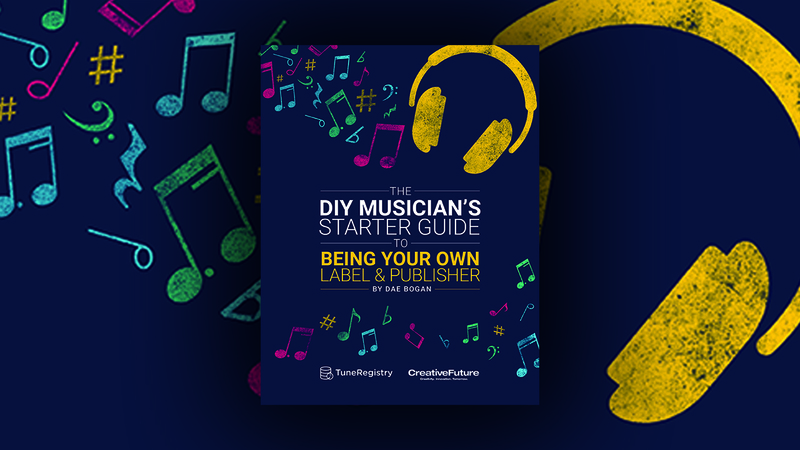 Ban the practice of distributing by market share unclaimed royalties that rightfully belong to DIY musicians and songwriters. Mandate that record companies provide complete and accurate (at the time of release) publishing information for each track within the metadata delivered to distributors/aggregators, and that the latter provides that information to DSPs. Do not expunge all past copyright infringement claims, only future claims upon the date of the enactment of the law. Maintain a representative MLC board of 50% publishers and 50% songwriters (with at least 1 unsigned songwriter on the board (e.g. Chance the Rapper)) as opposed to the BS 10 publishers, 4 songwriters (who’ll likely come from the major publishers anyway) that has been written in the bill. Respect the Berne Convention by not disregarding the musical works of non-US songwriters who have not (and will not) register each of their songs with the USCO or MLC. How else could the MMA be improved? Or do you feel that it is fair enough? Let’s discuss in the comments. Machine-to-machine communication is the ideal scenario if we want to enable on a global scale, with as little friction as possible and at a reasonable cost, the licensing of works and the payment of royalties to rightsholders. That at least is the stated premise for a recent discussion at the annual RightsTech Summit conference. But how far have we come? 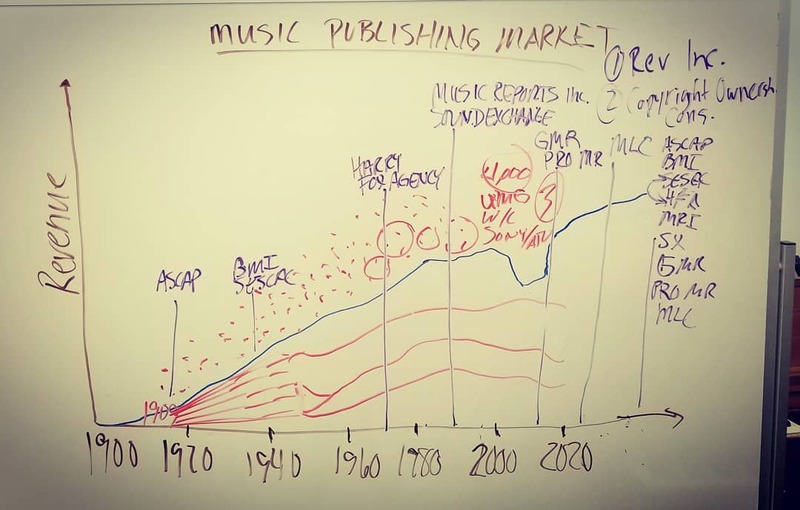 How close are we to achieving a digitized business environment for rights and royalties that is as fully realized as we see today in media distribution and consumption? Until code entirely does away with contracts will human beings will continue to add a value that no machine ever can? 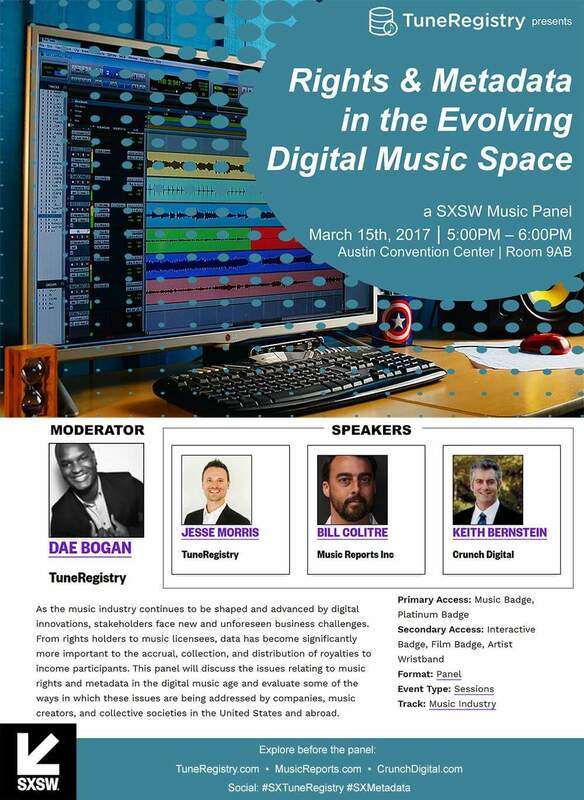 Panelists for the session moderated by CCC’s Chris Kenneally included Dae Bogan co-founder & CEO of TuneRegistry, a music and rights metadata management platform; Benji Rogers, a British-born, New York-based entrepreneur, who co-founded the Dot Blockchain Music Project, an attempt to create a de-centralized global registry of music rights using blockchain technology; Michael S. Simon, President of Rumblefish, a world leader in music micro-licensing and YouTube monetization and also CEO of the Harry Fox Agency LLC, the nation’s leading provider of rights management, licensing and royalty services for the music industry; and Michael Shanley, Vice President of IT Business Development at Music Reports, developers of proprietary databases and software applications that facilitate music rights administration. Pandora recently launched its sleeker new look. The centerpiece of the new user interface is the song artwork, which is now bigger and more prominent than ever. The artwork is also used as a color-washed background.